Containment Protocols: RPC-123 is to be kept within medium security small item containment locker A-23 in Site-04. The object itself is to be secured in a locked book clamp and placed in a sealed chemically stable plastic container. Humidity and temperature of the container is to be controlled for long term storage of RPC-123. The book clamp key is to be stored in a lock-box in alongside RPC-123's container and secured with a 6 digit locking mechanism. Access to the object is restricted to project leads, permission to access is granted by Site-04 secure requisitions. In the event that the clasp key is damaged, bitting is logged with Site-04 secure requisitions. In the event that the clasp key is lost, Site-04 secure requisitions must be notified immediately for binder lock re-pinning. 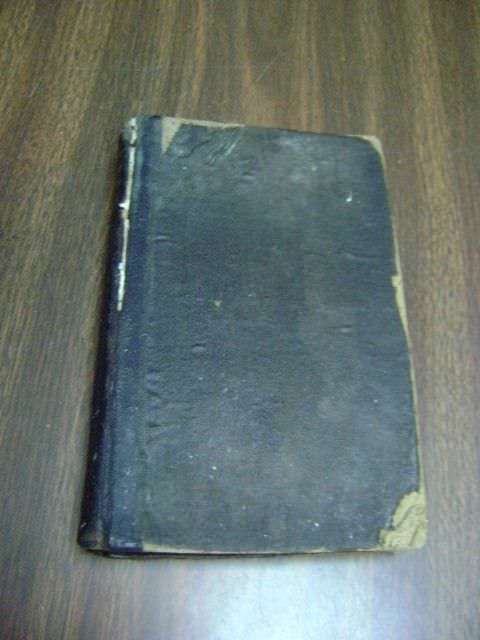 Description: RPC-123 is an 1868 primary school English textbook titled "Clarks English Grammar 40TH ED". The cover is a navy blue hard cloth type in rough condition. Pages are complete and legible with some yellowing and water-damage present. The object appears to be a cognito-hazard that, when read, causes victim to involuntary integrate contractions into their speech, the effect beginning one hour after commencement of first reading. Duration of reading, and subsequent readings, do not appear to alter the speed of effect. Reading the title present on the spine of the book does not appear to produce the effect. The effect is categorized into two phases, phase-1 having 4 distinct stages and phase-2 being a steady deterioration. Phase 1 is characterised by integration of spoken contractions with no observed impact on other higher mental faculties. Integration begins with common contractions one hour after first reading (stage 1). Approximately 24 hours after first reading, victim begins to contract words that have no recognized or colloquial English contraction (stage 2). Advanced phase 1 sufferers begin to formulate contracted sentences, beginning approximately 83 hours after first reading (stage 3). Speech malformation progresses to entirely contracted, unintelligible vocalizations approximately 60 hours later (stage 4). The use of contracted speech is not recognized by the victim as abnormal until the onset of stage 3, when use of contractions causes victim some distress and becoming severe distress by stage 4. Phase 2 is characterised by the progressive deterioration of general higher mental faculties. Speech effects typically fully develop over a period of 168 hours, after such time behavioural effects manifest in victim's general higher cognitive ability. Once victim reaches stage 4, physical neural damage becomes detectable; spread of this damage beyond speech centers marks the onset of phase 2. PET scans confirm diminished neural activity first manifests in speech centers, primarily broca's area, and spreads to adjoining cortices until all higher functions are affected. Damage spreads over a span of 48-72 hours, depending on the health of the victim, and is accompanied by behavioral degeneration. Progressive Neural damage halts approximately 10 days after first reading, leaving the victim's cognitive capabilities comparable to that of the average chimpanzee. To date all victims presenting with affected speech have progressed to higher neural damage. We are having a party just for me today. This is not my real birthday. It is April 12th and I will be 8 years old. I have invited my friends. They are all coming. But not Alex. He is on a trip with his family and cannot come. I do not know what kind of cake mom got me. She is keeping it a surprise and that is okay because I like surprises. Dad and mom told me not to peek at my birthday gift and I have not, even when I really wanted to. I am so excited for today to start. I just can't wait for the sun to come up. Forward: On 16/04/██ 07:30, ID20685 began reading RPC-123 for one hour. Onset of RPC_123 stage 1 effect suspected. Dr. Robert Milson: Good morning six eighty-five, how are you feeling? CSD-20685: 'Morning, doc. Can't complain. CSD-20685: Hey, Doc, would you mind calling me Michael? Dr. Robert Milson: Of course, Michael. On the desk in front of you is an A4 sheet of paper, please pick it up and read the passage. CSD-20685: Okay. [clears throat] We are having a party just for me today. This is not my real birthday. It is April twelve'th and I'll be eight years old. I've invited my friends. They are all coming. But not Alex. He's on a trip with his family and cannot come. I do not know what kind of cake mom got me. She is keeping it a surprise and that is okay because I like surprises. Dad and mom told me not to peek at my birthday gift and I have not, even when I really wanted to. I am so excited for today to start. I just can't wait for the sun to come up. Dr. Robert Milson: do you feel you read that passage as it appears on the page? Dr. Robert Milson: Please speak into the microphone, Michael. CSD-20685: Sorry doc. Yes, I do. Dr. Robert Milson: Okay, Thank you Michael. Security will take you back to your room in a few moments. An interview was conducted one hour after reading confirming onset of effect. Progression to stage 2 suspected. Dr. Robert Milson: Good morning Michael, how are you feeling? Dr. Robert Milson: Good, good. On the desk in front of you is an A4 sheet of paper, please pick it up and read the passage. CSD-20685: 'right. We're 'avin' a party just'r me t'day. This'sn't m'real birthday. It's April twelve'th 'n'I'll be eight years'ld. I've invited m'friends. They're'll comin'. 'not Alex. He's'n a trip with'is family 'n' can't come. I don't know what kind'a cak'om [cakeum?] got me. She's keepin' it a surprise'nd that's okay 'cause I like surprises. Dad'n'mom > told me not t'peek'it m'birthday gift 'n' I have not, even when I really wanted to. I'm so excited for t'day t'start. I just can't wait'r sun'up. closing statement onset of RPC-123 stage 2 effect detected at 49 hours and 2 minutes. Two days later stage 2 was confirmed. Progression to stage 3 suspected. Dr. Robert Milson: Michael- Michael. Calm down, we've seen this before and we're going to help you. Now. On the desk in front of you is an A4 sheet of paper, please pick it up and read the passage. Dr. Robert Milson: Michael, please. We will help you, but you need to help us. CSD-20685: [short silence] We're'vin'art'ust'r m't'day. [unintelligible]. S'pril'lve-[unintelegible]-beight'rs'ld. Ve'invi'm'friends. They're'll'min'. Nottlex. S'na'trip-[unintelegible]-ncan't'ome. On't-[unintelegible]-got'm. Sheepin'ta'prise'nd'at's'kay'seke'surp's. D'om[unintelegible]-'n'I'ven't-[unintelegible]. 'M'xci'ort'da't'start. I'us'twait'r'sun'up. Dr. Robert Milson: Okay, Thank you Michael. Security will take you back to your room now. closing statement onset of RPC-123 stage 3 effect confirmed at 96 hours and 5 minutes. Two days after reading, stage 2 was confirmed. Four days after reading, stage 3 was confirmed. Profession to Stage 4 suspected. Dr. Robert Milson: Michael, how are you feeling? Dr. Robert Milson: On the desk in front of you is an A4 sheet of paper, please pick it up and read the passage. Dr. Robert Milson: Okay, he's stage four. [short pause] Wards security, this is Doctor Milson, I have a CSD in interview room alpha-six. He needs a bed in the alpha observation ward. Please notify Doctor Wilson and the on-duty nurse. closing statement onset of RPC-123 stage 4 effect confirmed at 144 hours and 1 minute. CSD-20685 moved to alpha observation ward, east wing, bed 9.